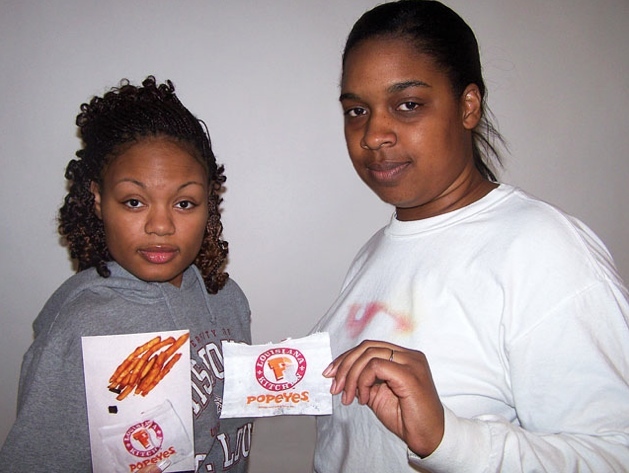 Illinois cousins Jewelelle Washington, left, and Stefanie Ward hold a Popeyes french fries bag in which they claim to have found two marijuana roaches. Washington is holding a photo of the bag, fries and alleged roaches. ​Two Illinois women claim they found marijuana roaches in the bottom of their Popeyes french fries bag, spurring a company investigation but leaving police with little means to figure out where they originated, reports Linda N. Weller at TheTelegraph.com. The incident occurred on March 5, according to the women. “I’m pregnant, and if I would have eaten it, it would have cut off oxygen to my baby,” Washington said, with somewhat questionable medical expertise. “And my cousin could have lost her job. It was just horrific. It was not like finding a piece of hair in your food. 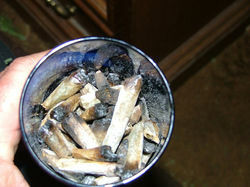 How do I know the person who smoked this didn’t have AIDS or hepatitis? We not only found one, but two ‘roaches,'” she said. “Somebody really could have been hurt by this,” she said, visions of dollar signs possibly dancing before her eyes. ​Popeyes refunded their money and offered coupons; the ladies declined the coupons. A spokeswoman from Popeyes corporate offices in Atlanta said officials are investigating the incident. “We take this claim very seriously and are investigating the allegation with our franchisee,” said Karlie Stanton, communications manager. “Clearly, a foreign object of this type, if it was in fact in the Popeyes product, had to have been introduced from an outside source.” Clearly, Karlie is being wasted in her current position and needs to work as a detective. When a reporter called the Alton restaurant manager and asked about the incident, she said, “No comment,” and hung up the telephone. ​Ward said she first called Popeyes, asking to talk to “Sharon,” the manager, but was put on hold for 15 minutes before she decided to drive to the restaurant to show the manager what she says was in the bag of fries. The women filled out a complaint form and signed it, they said. They then began making calls to Popeyes at various corporate levels. One woman at first thought they were talking about insects when they complained about the “roaches,” they said, then offered them coupons. “This was a little more serious than coupons,” Washington said she told the company representative. The cousins then talked to two men at the corporate level, with one of the corporate guys trying to pin them down on a price for compensation, the women said. “In no way was I pushing for a price,” Washington said. At that time, the women said they did want monetary compensation, but have since reconsidered and now want no money from Popeyes. They also said they don’t have the means to get a lawyer and go to court against the large corporation. “Too many odds are against us,” Ward said. Still, she said she hopes some good can come of publicizing what she says happened. Washington called an Alton police sergeant March 5 to report the roaches. The sergeant told her that Ward needed to file the report because Ward had picked up the order. The women went in person on March 10 to the police station to make an incident report. The women said the officer did not want to see the roaches, and the women said they would dispose of them. The sergeant turned the report over to the drug unit, but charges related to the incident are unlikely. “Because of the amount of time that passed after the incident when they reported this, there is no way to verify if the information is correct,” Alton Police Chief David Hayes said.